If you've been reading my blog for any length of time you will know that I'm a crap photographer. I don't know who to blame more, my camera or myself, but I have a sneaking suspicion that the fault lies with me. Somehow I've fallen into the company of several professional photographers, which only highlights my shortfalls in that area. Be sure to click on their names & links to check out their photography. Peter was a photojournalist at the Medicine Hat News when we first became friends. He was the first person to tell me about digital cameras and how they were going to change photography, that was in 1996. 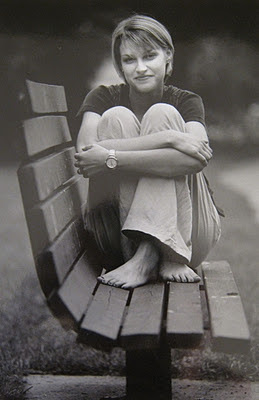 Here is a picture he took of me back in the day (with film). That's when I discovered that you had to take 100 pictures to get one good one. Sorry for the poor quality, it's actually a photo of the photo because my stupid scanner won't work. Melissa and Petara, two of my awesomely cool and talented friends, each have their own portrait & wedding photography businesses here in Medicine Hat. This summer I met Joey at our Moms & Tots group and was amazed by her glam and sometimes dark photography. My cousin Conni, who lives in Edmonton, somehow manages to juggle three children and a photography business. And last but not least there's Jeanette, one of my oldest and best friends, who's career has enabled her to become a fantastic travel photographer. This week she was featured on the Kodak blog, and has, in the past, been published and had her work displayed in shows. She is also the person who took the profile picture that I use on this blog, Facebook, Twitter, etc., which is an amazing feat in itself, as I am one of the least photogenic people I know. I'm not trying to be modest, it's the truth, my skin has a yellow undertone that doesn't photograph well and my face has bad angles, especially my nose. She must be miraculous if she can make me look good! Alison, I LOVE the picture Peter took of you, you're beautiful! PS - Thanks again for all the blog-love!